Some of you may have heard the recent hubbub about polar bear cannibalism. 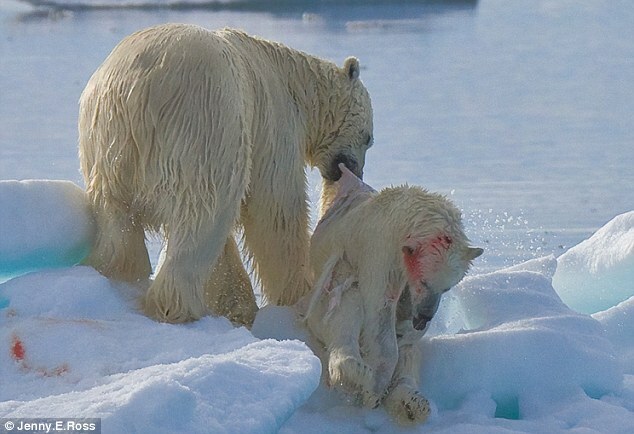 Photographer Jenny Ross snapped a few photos of a polar bear eating a cub. Following these photos are a string of media bandwagon hoppers (http://www.dailymail.co.uk/sciencetech/article-2071638/Polar-bears-Cannibal-pictures-prove-theyll-eat-bear-cubs.html) who have taken this opportunity to write a “controversial” attention grabber – that polar bears are vicious creatures that will even eat their own babies. Well f**k you media, once again your inadequate, opportunistic “minds” are misrepresenting the point. Frankly, these animals don’t deserve the bad light they’re being cast in. Anyone who understands the nuances of language can see how these articles (you can find many more about this topic) are all being very critical and disapproving. This is considered cruel, apparently, and makes the polar bear an immoral animal. This coming from humans, who have destroyed more of this world than any other living creature could hope to achieve, committed atrocities that sicken even ourselves, and who are directly responsible for the “rise in polar bear cannibalism” cases. What’s the reality of the matter though? Polar bears have it tough, probably one of the toughest out of all living creatures. Not only do they live in perpetual cold with a huge body and very limited food, human impact on fish populations and temperature cycles have made these animals even more desperate. These days, polar bears will wander into towns to rummage through garbage cans because they are that desperate for food. As a human, who has everything they want, a warm home and enough food to waste it by throwing leftovers in the bin, there is no possible way you could apply human concepts of morality to a desperate animal. Dr Ian Stirling of Environment Canada, who co-wrote the paper published in the journal Arctic, said cannibalism among polar bears has been witnessed before, but he said the rate of cannibalism may be increasing as the sea ice now melts earlier in the year. The primary food source for polar bears is seals, which they normally hunt from ice floes. The ice floes melt during summer and in some places the ice disappears altogether, making hunting for seals more difficult. Ross said the bears are forced to seek out other foods such as sea birds and their eggs, and human foods and waste, but these are not enough to sustain them. The melting sea ice problem is a terrible one that’s always saddened me ever since I heard of it from Al Gore’s “An Inconvenient Truth”. Polar bears will swim out in search for food and have no ice floes to rest on. With no other option, they just keep swimming and swimming in that freezing cold water, hoping some food will pass by or a bit of ice will appear, until their body just fails and they drown. Imagine drowning like that because you just couldn’t find somewhere to sit. That’s such a horrible way to live and die. So before you go accusing them of being “violent and occasionally cannibalistic” or that they’re “cruel”, take a look at the reasons why. Your opinion is not even valid because you don’t see the world the same way. You have hopes, dreams and luxuries. A polar bear has only one thought: to survive. Addendum: Some articles were actually a lot more objective about the whole ordeal (http://www.huffingtonpost.com/2011/12/08/polar-bear-eats-cub-cannibalism_n_1136428.html). I guess some media sources have more integrity than others. Also, sad as it is, I’m almost certain polar bears will be extinct (or very near to it) before the end of my lifetime (http://news.nationalgeographic.com/news/2007/09/070910-polar-bears.html). Some of you may be apathetic, but to me, it just puts everything into perspective – letting human greed destroy all the beauty on Earth, while petty little men squabble in war-torn countries and even pettier men hoard their wealth, built on the pain of others.